Info Peter Roskam was born in Hinsdale, raised in Glen Ellyn and graduated from the University of Illinois in 1983. He taught high school in the US Virgin Islands. His long time interest in public policy and government prompted him to move to Washington, DC where he was fortunate enough to work for his own Congressman Henry Hyde (R-IL) and Congressman Tom DeLay (R-TX) then in his first term in Congress. 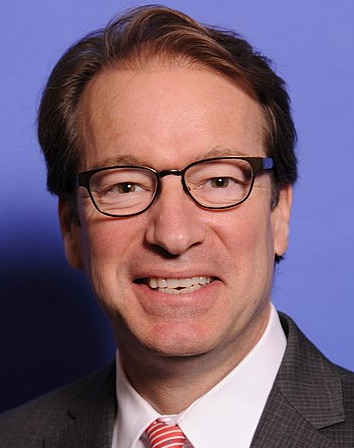 After serving on Capitol Hill, Roskam returned to Illinois and served as the Executive Director of Educational Assistance Ltd., a scholarship program for disadvantaged young people. This organization received President Ronald Reagan’s Volunteer Action Award in 1988. Roskam received his law degree from IIT Chicago-Kent College of Law in 1989. He soon set up a private practice in Wheaton and became a partner in the law firm of Salvi & Roskam & Maher. In 1993, Roskam was elected to the Illinois House of Representatives, where he served for six years. Today, he serves in the Illinois State Senate in leadership as the Republican Whip and Floor Leader. He serves on such high profile committees as the Senate Executive Committee, Environment and Energy, Rules, Judiciary and the Insurance & Pensions Committee. Roskam has been an advocate for upholding conservative Republican values throughout his tenure in the legislature. His reputation as a leader on economic and social issues has earned him the recognition or appreciation from numerous organizations such as the National Federation of Independent Business, Illinois State Chamber of Commerce, Illinois State Medical Society, American Jewish Committee, Illinois Federation for Right to Life, Illinois Citizens for Life, Christian Home Educators Coalition, Illinois Family Institute, Employment Law Council, Illinois State Crime Commission, Illinois Judges’ Association and the Illinois Farm Bureau. Roskam and his wife, Elizabeth, live in Wheaton with their four children.